Estonian newcomer Maarjan Ridalaan was discovered a little over a year ago while celebrating her 15th Birthday with family at a local pizzeria, and has since enjoyed a spectacular rise through industry ranks making her runway debut at Prada's Spring/Summer 2014 show. Ridalaan's haunting grey blue eyes, tempestuous pout, and elegant 175 cm frame have continued to captivate industry attention via promising editorial bookings for Purple Magazine and British Harper's Bazaar, and Isabel Marant Etoile's Spring/Summer 2014 Look Book. Ridalaan's fresh faced beauty, youthful spirit, and versatility in front of the camera are being carefully nurtured and introduced to the international market via a supreme management team led by mother agency LUV Models, Modelwerk Hamburg, Tess Models London, Elite Model Management Paris, and The Society Management NY. 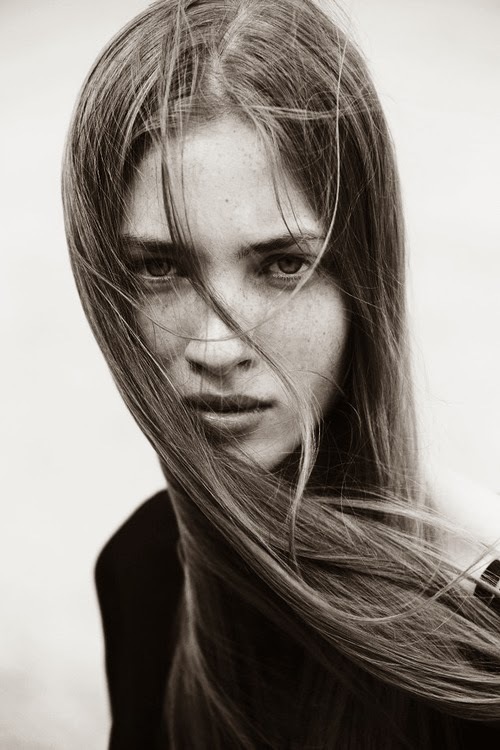 Currently based in London, Ridalaan has been steadily building up her portfolio testing with photographers while meeting with prospective clients. A classic beauty through and through, Ridalaan's ability to morph seamlessly between tomboyish indifference, to femme fatale, and young sophisticate is the trump card which will enable her to appeal to a broad range of runway and editorial clients. Equally impressive is Ridalaan's cool demeanour, endearing sweet spirit, and enthusiastic yet pragmatic approach to modelling. In between modelling assignments, Ridalaan took a moment to chat exclusively with IMA about her stunning Prada debut, modelling's harsh realities, and her innate love of music, acting, and astronomy. Inoubliable Model Army (IMA): Hi Maarjan, thank you for chatting with IMA. Firstly congratulations on your stunning runway debut at Prada during the Spring/Summer 2014 season! How would you sum up your first show season and were you satisfied with how the season developed? 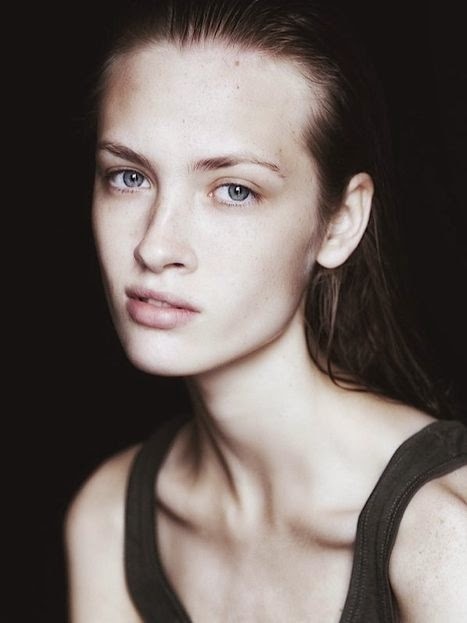 IMA: As a brand spanking new face to modelling, would you mind filling in IMA on your backstory? MR: I'm 16 years old. I'm from a summer capital of Estonia called Parnu which is a small town. I was discovered in Estonia by Barry Elkins and Enel Soeson from Luv Models while celebrating my 15th birthday in a pizza restaurant with my family. I was very surprised and couldn't really believe it in fact. I wasn't sure if modelling was something I wanted to do at the time. It took me more that a week to make a decision. IMA: Describe your childhood and upbringing, and were you at all conscious of your beauty growing up? MR: My childhood was unforgettable with a lot of action going on all the time haha...! I was born in Tallinn but moved when I was a year old to a little village called Vandra, where I spent most of my childhood. It's a place where all my family roots are from. I was not aware of my beauty growing up at all, being always that kind of girl who didn't care... I didn't wear any make-up. My hair was always a mess - so I guess that says it all. IMA: You were one of the standout newcomers at Prada's Spring/Summer 2014 show. What was involved in the casting process and what was your reaction when you heard that you'd been confirmed for the show? MR: As it was my first show ever, it was very confusing for me as I didn't truly understand what was going on. But when I was finally confirmed I had two emotions running through my mind... I was nervous and excited at the same time, but it was such a fun experience! 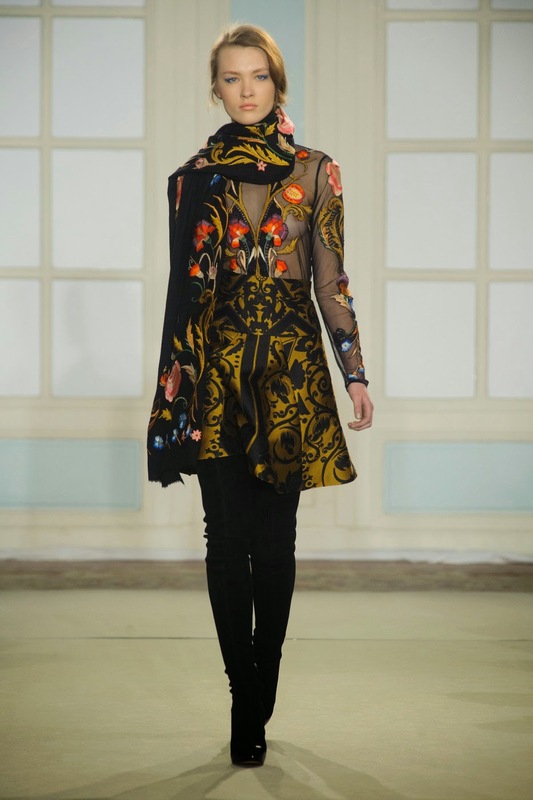 IMA: Competition during the Spring/Summer 2014 show season was intense with more newcomers than ever vying for limited runway spots. Did you find the experience of doing the rounds to castings daunting given that you literally have less than a minute to make a favourable impression on the powers that be? MR: I don't really think so as it's always just a case of showing your book, walking, and the rest is not up to me anymore. The only thing I try to do is to make sure I get plenty of rest in order to look my best. 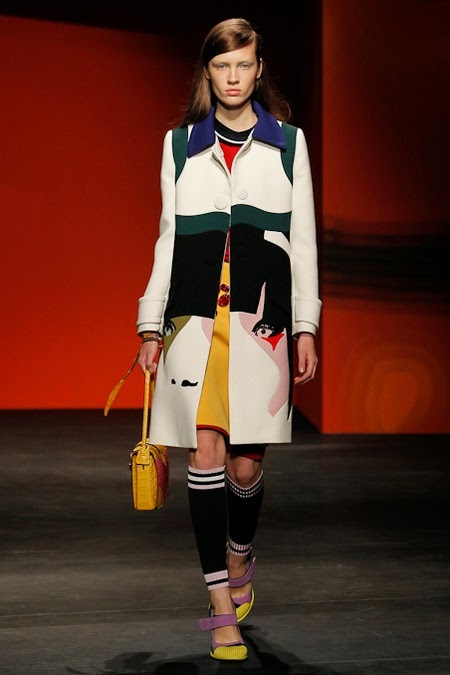 IMA: You also appeared in the Sonia Rykiel show (another iconic brand) during the Paris collections. Have you found your style sensibility has evolved as a result of your industry exposure? Which shows were you most blown away by during the Spring/Summer 2014 season? MR: It sure has changed but it's still pretty casual. Sometimes I love to play with my look a little more but usually I like to keep it simple. I was in love with the Valentino collection, and I also liked the Alexander Wang and Balenciaga collections - it's my kind of style. IMA: Beauty clearly runs in your family with your sister Lisanna also being a model placed with LUV Models. Does it help having someone so close to share your modelling experiences and challenges with? MR: I'm sure it does. I can't wait for my younger sister to step into it. My dream is to teach her all about the industry and to travel together, that would be awesome! IMA: You've been steadily building up your book with some impressive test shots by photographer Paul Morel, Thomas Babeau, and Michael Roses. Are there any key photographers that you have worked with who you felt captured you at your best? MR: I think every shooting has offered me a new experience and every photographer has been able to capture me in a flattering way that is new and interesting for me. IMA: In the relatively short amount of time that you have been modelling, what has surprised you most about the modelling and fashion industries? MR: Everything I've learnt, because my impressions about modelling were absolutely different. Now I feel how it really is and I would love to learn more. Before I had never really understood how modelling truly works - it can be hard at times. A model needs to have a lot of self-discipline, determination and focus because this job can be really lonely. People in this industry can be very hard, in the end it is just business for everybody and I try to appreciate every moment while I am doing this job. To stay centred, grounded, and happy within myself. IMA: The Prada Spring/Summer 2014 show was an incredible fusion of fashion, artistic expression, and radical feminism. What was the mood backstage and how did it feel when you were on the runway walking past this magnificent murals of various interpretations of womanhood? MR: Totally incredible! Backstage I was trying to stay calm all the time and just keep smiling. When the time came to step up to the stage, it felt amazing - I forgot about being nervous and tried to be very focused. IMA: Beauty is only part of a model's overall package, what are your interests and passions beyond modelling and fashion? IMA: Modelling offers long-term possibilities for a very select few. What do you hope to achieve in your modelling career and what other professions would you have considered had modelling not intervened? MR: I can't predict what will happen in the future so I prefer to live in the moment... If I wouldn't be a model, I would perhaps be interested in astronomy especially after having seen the movie Gravity! I've also thought about being an actor, in the future I would like to at least try some acting. MR: This question has made me think a little. I can truly say that I'm a good-hearted and friendly person. And oh, I smile all the time even if there is no particular reason ;-).